If you follow me on facebook, you already know that once again NaNoWriMo (National Novel Writing Month) has taken over my life and with great joy I have allowed it to (as will 200,000+ around the world!)! Here was my creativity before I jumped into my third historical novel “Sir Michael’s Mayhem.” So for the sake of silliness. . . Fingers were stretching to write their first words. 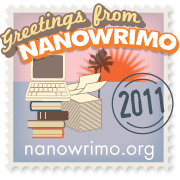 For NaNoWriMo was finally here. To be considered a “winner” at any cost. A Viking, a ninja, throw those in and more! But we must keep writing till November 30th at midnight. So why do we do it? This made dash to write? When we put the rest of our lives on the back burner each night? Only some of us quit when the going gets gory. So press on to the winner circle, my Wrimo friends! It’s the only way that this month should ever end! Rubbing our carpel tunnel wrists as we fall fast asleep. Best wishes on meeting your goal. I’m revising a book and I have a personal goal of getting it completed by Nov. 30. Since I have almost completely changed the plot, it’s like starting from scratch. I pray you have success with that! I have a major rewrite to do on a novel I wrote this summer – waiting till November is done before tackling that! I find that first major rewrite changes a lot of things in a book – and usually for the better. It’s always an adventure though – I hope you enjoy the process! this is awesome! Very motivational!